In conjunction with Portland Textile Month, join artist Palmarin Merges at Blackfish Gallery as she discusses her process and how her residency at Textile Hive inspired this new body of work. Drawn to the flower patterns and abstractions in the Textile Hive collection, Merges reflected on how “each culture, continent and country ascribes their own meanings to flowers. Flowers connect me to particular places and moments in time. 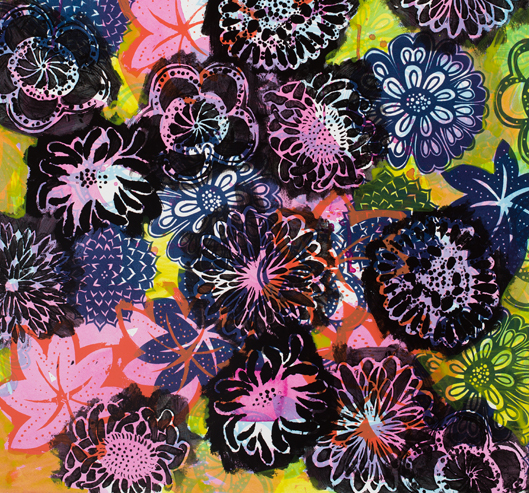 The flowers in textiles are bouquets: gifts to our desire that, despite our differences, we strive to make whatever place we are in a home.” She translated these reflections into her new series of mixed media screen prints on paper.